By so many standards, the FJ40 Land Cruiser is the definitive 20th century 4x4. 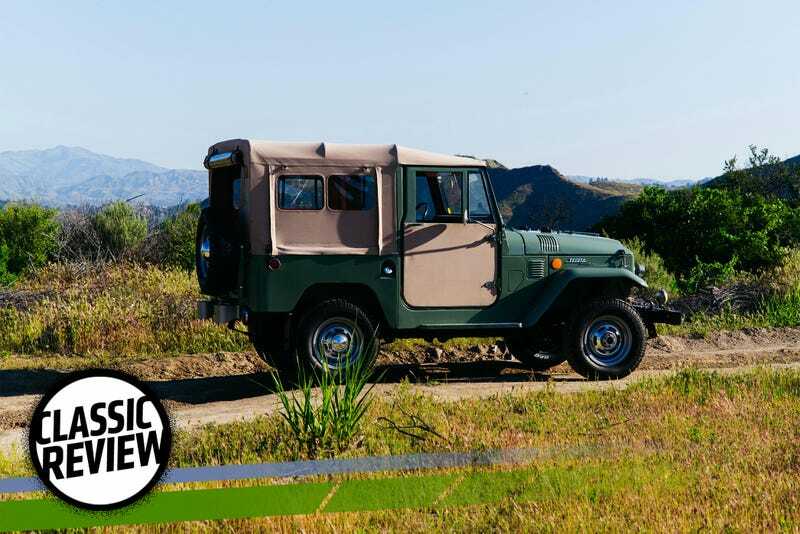 With an international pedigree like a Land Rover, the rugged simplicity of a Jeep and swagger like an old Bronco, the FJ is a greatest hits album of classic trucks. Fun to look at, sure, but driving one will take your appreciation to a whole new level. The FJ40 was in production from 1960 to 1984, and all the way up to 2001 in Brazil, if you can believe it. It was Toyota’s best-selling model in the United States between 1961 and 1965, an easy accomplishment seeing as it was the only new Toyota sold here in the U.S. during those years. By 1965 global production had reached 50,000 units. By 1973 300,000 of them were roaming the planet in either hardtop, soft top, station wagon or pickup form. The “F” in FJ refers to the Type F engine and the J stands for jeep, meaning the more generic WWII-borne use of that term and not the brand Jeep currently owned by Fiat Chrysler. Throw that knowledge around at parties and you’re sure to get some phone numbers. The “40” refers to the displacement of the inline-six engine and the “Land Cruiser” name was conceived in 1954 by Toyota technical director Hanji Umehara who said: “I had to come up with a name for our car that would not sound less dignified than those of our competitors. 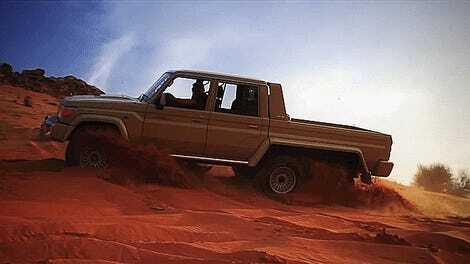 That is why I decided to call it ‘Land Cruiser,’” in The Story of Land Cruiser from a 1985 Toyko 4x4 Magazine. Some people rove the land, some people cruise it, no wrong way to go as far as I’m concerned. In terms of its importance to Toyota as a global automaker to be reckoned with, you simply cannot overstate the impact the FJ40 had. In addition to being Toyota’s best-selling vehicle in the U.S. in the early ‘60s, it solidified the brand’s reputation for building strong, reliable vehicles. Improving upon the old J20, the FJ40 added a low range subgear that improved acceleration and performance on rough roads, saw the 2-speed transfer lever moved to the instrument panel and 3-speed shift lever moved to the column, which made room for a third person to sit upfront. Folding jump seats in the rear were another key addition to the FJ40 as they allowed for more cargo or passengers to be carried. I can now personally attest that that rear area is much better suited to carrying cargo than people, thought it is a unique experience to get jostled around in the back of a soft-top FJ40. Visions of being a photojournalist on assignment in some far-flung country instantly flooded my mind while I held onto the roll bar with one hand and my camera with the other. It is thoughts like those that have ultimately given the FJ40 such fierce staying power over the years. Their prevalence in remote regions around the globe leads even the most casual observer to view them as something of a curiosity, especially the variants that didn’t make it to our shores before U.S. sales of the FJ40 wrapped up in 1979. While this soft-top model that I drove is indeed an eye-catching rig, who wouldn’t opt for a pickup or wagon variant given the choice? These were the go-to vehicles for U.N. peacekeepers and warlords alike, and in many places they still are. The idea of the FJ40 being tough enough to handle the harshest conditions on the planet took root in the subconscious back then and has not only endured right up to present day, but blown up like tech stock prices in the ’90s. How else do you explain the jump in FJ40 values over the past decade? Back in 2007 a mint condition example could be had for around $25,000, by 2011 that amount had nearly doubled and in 2015 a high water mark well into the six figure range was reached. The market has adjusted since then, but a Concours condition 1969 FJ40 will still run you around $85,000 according to Hagerty. The folks that grew up seeing these vehicles on the nightly news or in the pages of National Geographic now have the money to buy them as a pleasure vehicle, seeking to restore some of their youthful adventurousness, all while adding a much needed “cool factor” to their lives without being ostentatious. It is the happy medium between the tweed wearing, duck hunting Land Rover Series III crowd and the “hold my beer” Jeep CJ/Ford Bronco contingent. I have to gush over the whole look of this particular example. The light green paint combined with sand beige cloth and orange leather makes for about as complimentary of a color palette as I can imagine on the FJ40. The contrast between the paint and the orange blinkers and safety reflectors stands out as an aesthetic touch. Beautiful enamel badges on the rear, angled outside view mirrors, and vertical hood vents opposing horizontal side vents don’t usually grab the eye, but they do on this vehicle. While moving a box in the cargo area I found the original yellow Arizona license plate, which looks fantastic I might add, the original owners manual, and the original tool kit. I could have spent the rest of the day flipping through the pages, learning how to take the entire truck apart and then actually done it since the toolkit had everything I’d need, but something tells me the owner would have been less than pleased. Details like how a license plate changes the aesthetic would likely go unnoticed on another color, or on nearly any other vehicle for that matter, but it was noteworthy on this FJ40 and that’s largely why I found it to be such a fascinating vehicle. Usually the tendency to want to run your hands over bits and pieces of a vehicle is reserved for carefully crafted luxury cars, but the FJ40 is an outlier. Every lever, handle, button and switch begs to be flipped, pulled or turned. The dimpled, ultra-thin rimmed steering wheel is gigantic by today’s standards, but it’s a joy to hold onto, which you had better do if you want the truck to do what you want it to. The FJ40 wasn’t going to set any speed records back in the day and the passing of time certainly hasn’t changed that. It’s not so much slow as it is methodical in its approach to acceleration. The clutch is heavy with a definitive pickup point and you really have to give it some gas to get going. Once you’re in motion you’ve got a plenty of time to figure out your next move thanks to 1st gear being nice and tall. The transitions to second and third gear are a little eaiser since they do have synchros, but I still had to be patient with second. If I wasn’t, the sound of grinding metal would cause me to wince and then apologize to the custodian of this fine vehicle. Fortunately, this only happened a few times while I was at the helm and it is, after all, a durable old truck. I did a couple laps on our top secret dirt road and found that guiding the FJ40 around deep ruts was easy, even though I didn’t have the best view of the terrain in front of me. The beauty of a narrow, boxy vehicle such as this is that you have a clear idea of where the wheels are in relation to obstacles and how much room you have to work around them. On top of that, if you really wanted to get a good look at tire position all you’d need to do is stick your head out the window, or even better, prepare in advance by taking the doors off. Compared to the only modern 4x4 that can be even remotely described as “basic”, the Jeep Wrangler, the FJ40 is a mini-tank. Strip away all the modern amenities found in a new Wrangler and you’re still left with a vehicle that feels incredibly bloated compared to the FJ40. The simplicity of the FJ40 allows you to quickly bond with it and I can only hope that I’ll get a chance to do some true bushwhacking in one at some point. As for the driving experience on pavement, well, it wasn’t nearly as agricultural as I thought it would be. I topped out at about 45 mph due to where I was driving it, but it certainly felt like it would have had no problem reaching the factory claimed 85 mph top speed, should you need to outrun people or animals wishing to do you harm. By now you’ve probably come to realize that I quite like the FJ40 Land Cruiser and this example in particular. It’s a wonderfully simple vehicle that is much more than the sum of its parts not only because of its capabilities but because of the things that people associate it with. Toughness, adventurousness, reliability, style... the qualities of an FJ40 read like the Tinder profile of someone you’d bring home to your parents. Are there downsides to this thing? Of course, it’s a 48-year-old truck. It’s slow, loud, the brakes are there, it’s hardly what I’d call practical in this modern world, and a nice example like this doesn’t come cheap. This truck ran the owner around $65,000 back in 2014, not an insignificant amount of money. Despite all of that, I love it. I’d been a casual admirer of the J40 Land Cruiser for years, particularly the FJ45 pickup, but now having driven an FJ40 soft-top I’m fully committed to owning one someday. It’ll likely be a much rougher example than this beautiful rig, unless of course I win the lottery or get run over by a Lexus, but even covered in surface rust, dented and scratched I’d enjoy it all the same. An old Land Cruiser isn’t a vehicle that needs to be immaculate to be enjoyed, but it sure doesn’t hurt if it is.